The complex nature of problems affecting marine ecosystems requires that ecological dimensions and management be fully integrated, as management that ignores these linkages is likely to miss critical interactions that may lead the system toward an undesirable, irreversible state. Providing suitable and appropriate scientific knowledge to communities, resource managers and decision makers is therefore key to guide actions for the effective long-term conservation of natural resources. As a result of this, a number of CORDIO programmes in 2016 have contributed towards integrating science, practice and governance at local, national and regional levels. With a changing climate and rapid economic and population growth, the Ocean is no longer thought to be as infinite and immune from human impact as previously believed. Marine spatial planning has been proposed as a vital tool that will help speed solutions to the ever increasing threats and often complex challenges surrounding ocean use. 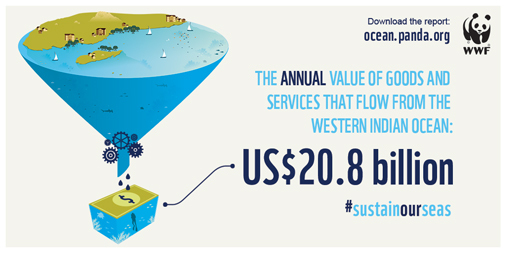 The Sustainable Ocean Initiative (SOI) https://www.cbd.int/soi/training has promoted MSP through workshops and training globally, as well as in the WIO. 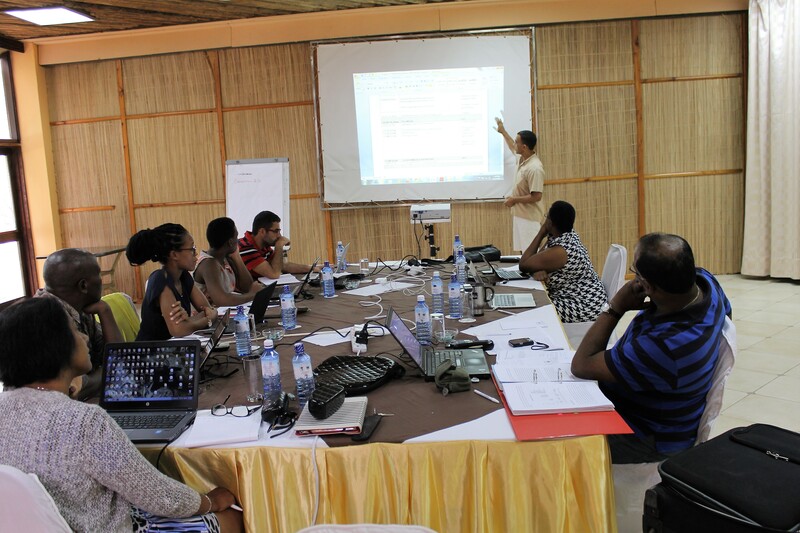 In early 2016, CORDIO helped to organize a SOI training workshop held in Madagascar. One of the main aims of the workshop was to discuss the importance and relevance of Marine Spatial Planning (MSP) towards achieving the Aichi Biodiversity Targets https://www.cbd.int/sp/targets/ in the region. Data scarcity and insufficiency are major obstacles to successful MSP, and planning must often proceed with the best available, though imperfect, data. 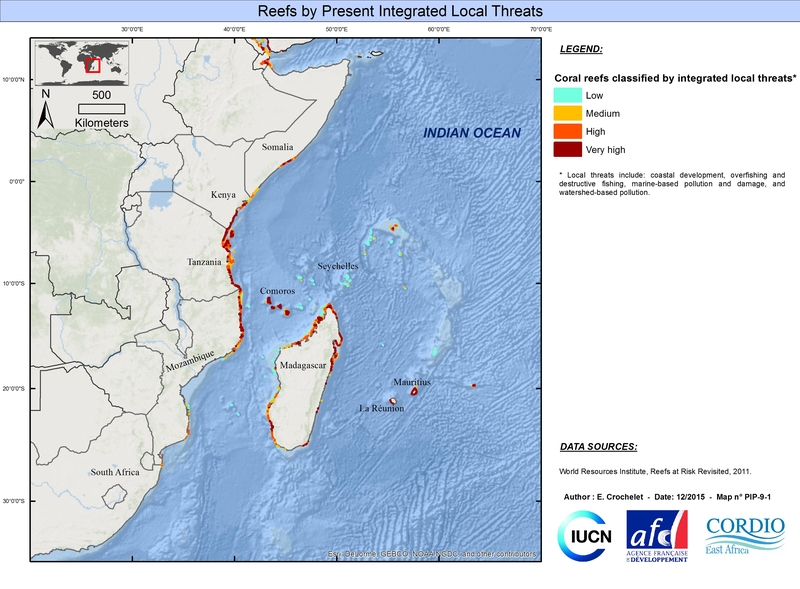 To help bridge this gap, CORDIO and the IUCN, and funded by the French Development Agency (AFD), prototyped an online marine spatial atlas resource for the WIO region, dubbed MASPAWIO (Marine Spatial Atlas for the Western Indian Ocean). The platform is intended to improve access to marine data layers from existing sources, as well as outputs from regional projects, and to grow to become a key resource supporting MSP in the WIO. 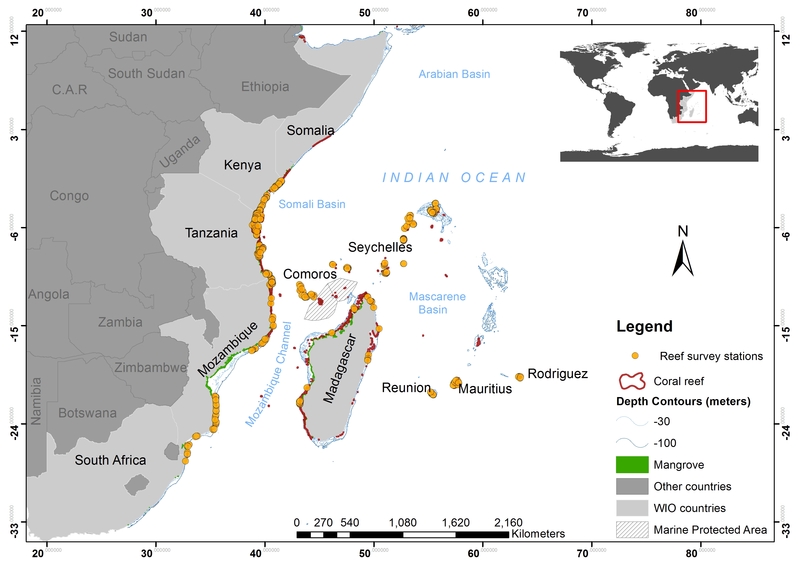 Through the Intergovernmental Authority on Development (IGAD), which covers the Horn of Africa, CORDIO was involved in two projects bringing marine biodiversity data into spatial planning processes. The project in Djibouti, with IUCN and the Cousteau Society, developed a Seascape conservation plan with a focus on the inner waters of the Gulf of Tadjourah. 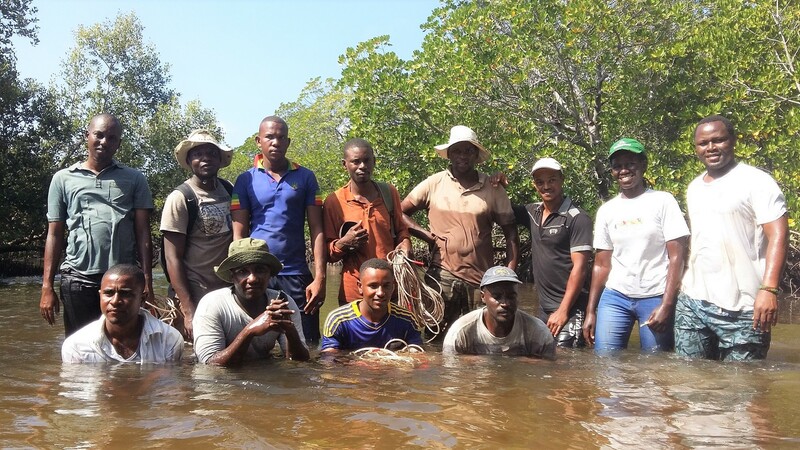 The project in Lamu County, Kenya, with the World Agroforestry Center (ICRAF) and National Museums of Kenya (NMK), compiled marine biodiversity data to be included in a County scale biodiversity resource to be used in the County Spatial Planning processes. 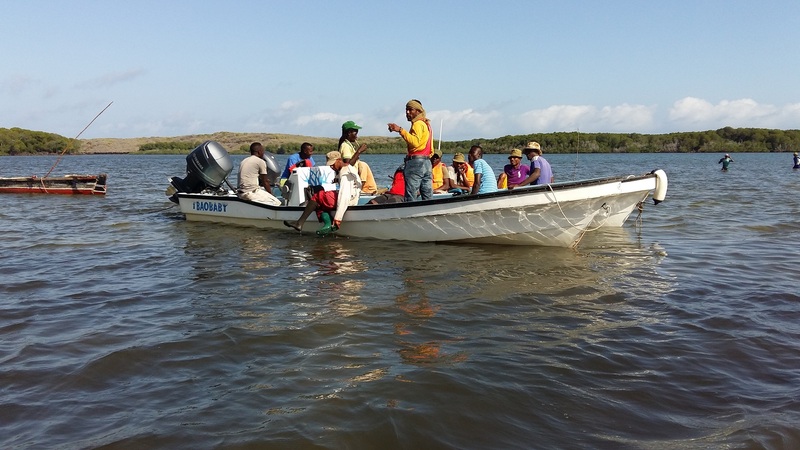 Based on experience in the Djibouti and Lamu projects, CORDIO has been further contracted by IGAD to mobilize and secure marine biodiversity data and subsequently make it publicly available through an open platform. This initiative builds on MASPAWIO as a knowledge sharing platform, alongside customizing a biodiversity databases BRAHMS, for use with marine ecological data. With the increased interest and investment by WIO and African countries towards a ‘Blue Economy’, it is important to ensure development is conducted in a sustainable manner. The Ocean Economy report for the Western Indian Ocean, prepared by Worldwide Fund for Nature (WWF) together with CORDIO East Africa and the Boston Consulting Group, provides some new and innovative estimates of the economic outputs from living marine. It combines an economic analysis of the region’s ocean assets with a review of their contribution to human development. 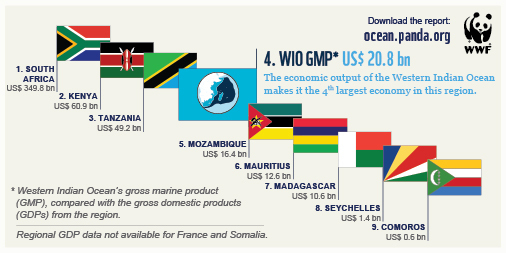 The results estimate the annual economic output of the WIO region at close to US$21 billion, which makes the ‘ocean economy’ the fourth largest among the countries of the region. The most economically valuable activities are coastal and marine tourism, followed by carbon sequestration and fisheries. The analysis finds that the region is heavily dependent on high-value ocean natural assets that are already showing signs of decline. Importantly, the report offers a set of priority actions required to secure a sustainable, inclusive ‘blue economy’ for the region. A few things are core to the success of ocean-led development: inclusive and just governance at societal levels, and of ocean resources, and the establishment of partnerships including those with governments, the business sector and representatives of stakeholder and civil society groups. After its publication in 2017, the WIO report has been launched at events in several regional countries (Madagascar Mozambique, Tanzania and Kenya) as well as being presented at the UN Ocean Conference for SDG 14 from June 5-9 2017 in New York. It is hoped that the report will be used in each of the WIO countries, to help guide policies towards sustainable use of ocean resources and implementation of the Sustainable Development Goals. CORDIO has been supporting the GCRMN in the Western Indian Ocean since our inception in 1999. In 2016, we spearheaded both regional and global efforts under the GCRMN. CORDIO led the coordination and preparation of the 2016 Western Indian Ocean (WIO) coral reef status report, supported by the Indian Ocean Commission’s Biodiversity Project. The 2016 report includes chapters from 9 countries in the WIO, as well as a regional synthesis including a report on the 2016 coral bleaching event. The 2016 report aims to bring attention to the condition of coral reefs in the region, and provide recommendations for their conservation to decision makers in the WIO. The process involved the collection, management and harmonization of data into regional datasets for fish and benthos, which will continue to grow in coming years. As part of the project, CORDIO co-organised and presented at the regional Coral Reef Task Force (CRTF) workshop in Zanzibar in May 2016, which was organised to engage CRTF members in preparing the GCRMN report. In 2017, CORDIO will finalise, publish and distribute the report with the support of the IOC. A key target is to launch it at the 10th WIOMSA Symposium in Tanzania in November to inform regional policy and decisions. CORDIO helped develop a programme to strengthen the GCRMN, with a four-year workplan running from 2017 to 2020. The process will attempt to strengthen and upgrade monitoring programmes organised under the GCRMN’s regional networks by improving standards for measurement, generating Essential Ocean and Biodiversity Variables and increasing the sustainability of monitoring programmes/networks. The process will be designed to help countries report on the Aichi Biodiversity and Sustainable Development Goal targets and strengthen information flows to support local management and decision-making. At the ICRI General Meeting a decision was taken to move forward with strengthening the GCRMN. The impact of climate change on vulnerable coastal areas is exacerbated by poorly planned and uncontrolled development coupled with unsustainable exploitation of resources, and other non-climatic stressors. Effectively addressing these issues calls for timely access to information required to support an evidence-based approach to development planning and management of the coastal zone, at all relevant levels of governance. 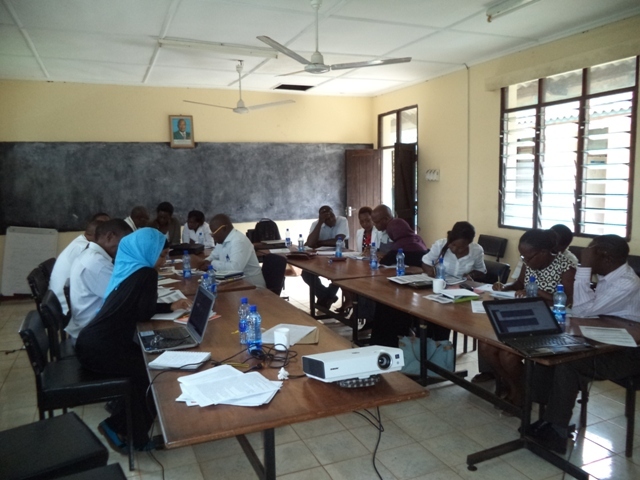 CORDIO has been implementing the Kenyan node of a regional 4-year project titled ‘Emerging Knowledge for Local Adaptation to Climate Change’, which began in 2014. The project is funded by the Western Indian Ocean Marine Science Association (WIOMSA), through its Marine Science for Management programme (MASMA) with South Africa and Mauritius as the other participating countries. In 2016, CORDIO, in partnership with National Environment Management Authority (NEMA) and 3 coastal county governments undertook a knowledge assessment on the availability, access to and use of information on coastal climate risks for evidence-based adaptation planning within the context of integrated coastal zone management. The assessment involved interviews with county government staff from various departments as well as other coastal management actors. Participation in county planning and decision making processes helped in corroborating feedback from the interviews. 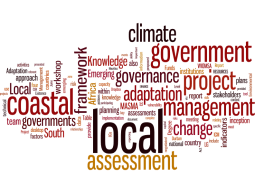 The knowledge assessment built on the 2014-2015 local governance baseline assessment which identified key gaps with regards to the capacity of the county governments to facilitate coastal adaptation. A workshop is planned for 2017 to provide a platform for dialogue between the knowledge producers and users, primarily to come up with possible strategies to enhance evidence-based coastal adaptation by the county governments. Detailed assessment reports as well as policy briefs on the various components of the assessments will be disseminated to the respective county governments and other relevant actors. 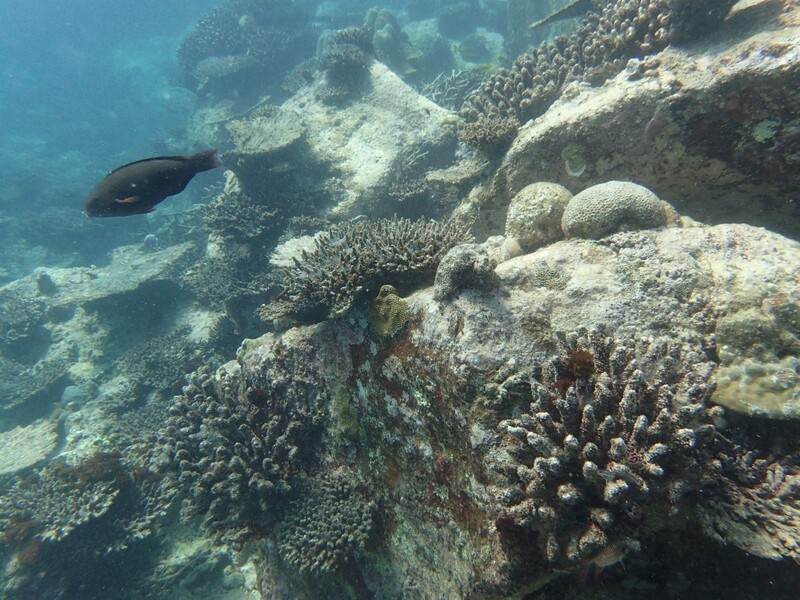 CORDIO is working under a contract with the Island Conservation Society (ICS), as part of the Outer Islands Project (OIP) to improve management of coral reefs on four outer-islands in the Seychelles (Alphonse, Desroches, Poivre and Farquhar). The OIP is supported by the Global Environment Facility (GEF) through UNDP. The OIP project seeks to promote the conservation and sustainable use of marine biodiversity in the outer islands by expanding the protected areas system and strengthening protected area management. To support adaptive management at the four islands a coral reef monitoring protocol and a coral reef management plan will be developed to suit the needs for management. A workshop was held at ICS offices in Victoria, Mahé, from 11-12 October 2016, and with involvement from various ICS staff and other conservation organisations, the workshop assisted with the development of a draft coral reef monitoring protocol that meets the needs and constraints of the individual islands. In addition, a national coral collection facility will be designed to be hosted at the University of Seychelles. The facility will support education and training in coral reefs and marine conservation. The next steps in the project will be to work closely with ICS to organize another workshop in 2017 to finalise the monitoring protocol and complete the coral reef management plans and a practical plan for the coral collection facility. 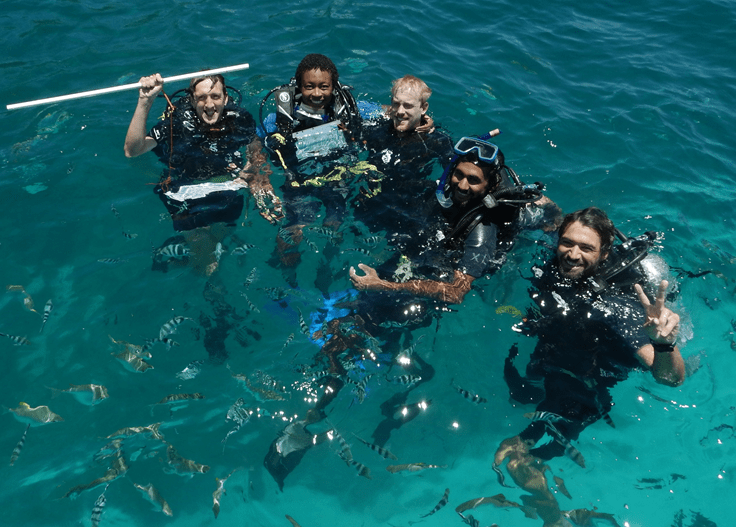 From the experience gained carrying out this contract, CORDIO is well placed to assist other coral reef managers develop their own tailor-made coral reef monitoring and management tools. Environment Impacts Assessments (EIAs) are conducted to ensure that environmental and social impacts of development projects are minimized. CORDIO has been involved in a small number of EIAs in Kenya and maintains an EIA Lead Expert license, but mainly uses this status to contribute to the national EIA processes, such as in critique on sensitive projects and to improve standards. In 2016 CORDIO was involved in two projects with regards to their EIAs. In January 2016, sand harvesting in Diani, Kwale County by the China Road and Bridge Corporation for construction of the Standard Gauge Railway was stopped by Kenya’s National Environment Tribunal. This was after strong opposition from local residents. 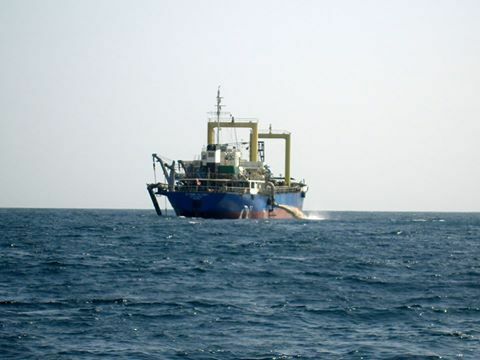 CORDIO conducted a review of the project EIA, confirming that it was grossly inadequate as it did not even perform an assessment of physical and biological impacts at dredging sites. Based on this, and many other issues with the EIA, CORDIO issued a rejection comment to NEMA’s license to the sand harvesting. The historic monument of Fort Jesus, a World Heritage cultural site, is located on the southeast tip of Mombasa Island. The coral cliff is being slowly eroded by waves, posing a serious threat to the monument. The construction of a sea wall was recommended as a remedy to protect the Fort. CORDIO was invited by the National Museums of Kenya (the custodian of the Fort) to conduct a part of the EIA for the wall focusing on the marine ecosystems and biodiversity, and fisheries. Overall CORDIO found no substantial negative impacts of the wall construction on marine biodiversity. However, the design proposed for the wall, for which no options were presented, and which requires several phases of funding and construction, is questionable. It also includes the creation of significant new land in front of the wall, posing a number of major unanswered questions. 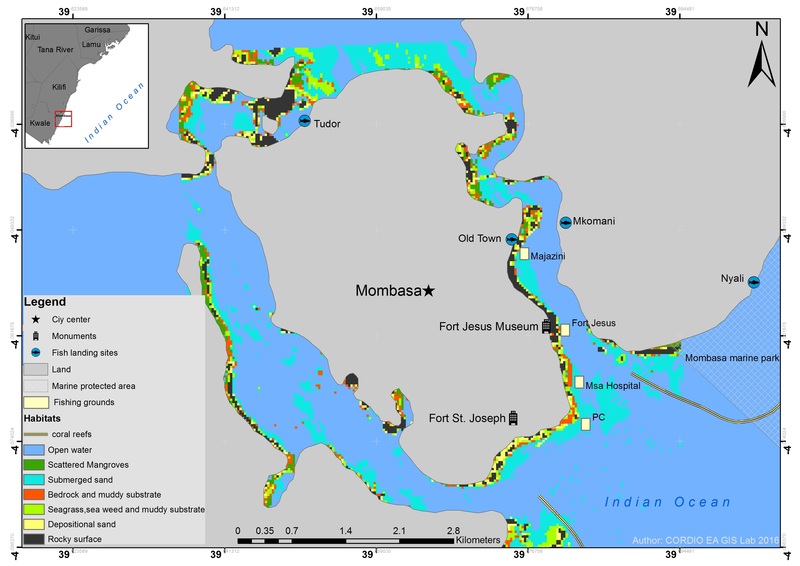 These include environmental impacts after the first phase of construction (retention of storm- and sewage outflow behind the new wall before infilling), social and economic implications of new land at the heart of Mombasa’s Old Town, and impacts on the cultural values for which the Fort has been inscribed as a World Heritage Site. CORDIO recommended that the design of the proposed wall needs further clarification. 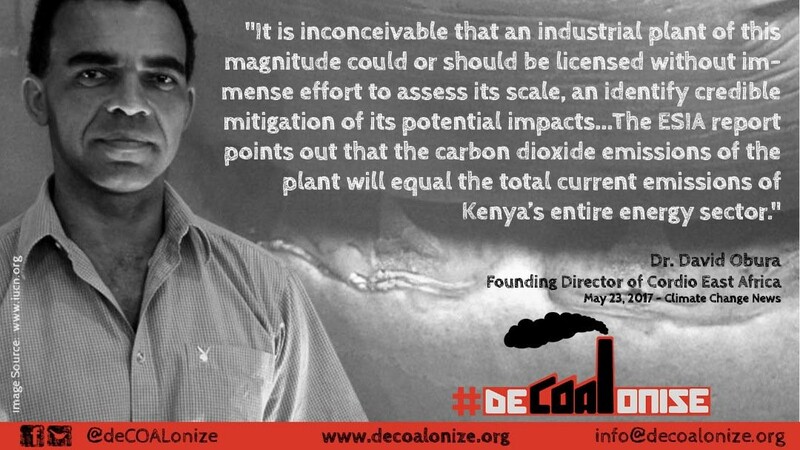 With an increase in major development projects expected along the Kenyan coast in the next few years such as the coal power plant and port in Lamu, CORDIO will continue its work assessing EIAs to try to ensure that sound environmental conservation measures are put in place to minimise the potentially catastrophic environmental impact of these projects. Biodiversity plays a vital role in determining areas for conservation and establishing conservation priorities. Incorporating biodiversity conservation into management of fisheries and marine ecosystems contributes to sustainable provision of ecosystem goods and services and helps address critical issues. Through funding from the European Union, the Inter-Governmental Authority on Development (IGAD) has been implementing a Biodiversity Management Programme (BMP) whose specific objective is the conservation and sustainable management of ecosystems and their services in the IGAD region. CORDIO was contracted by the IUCN as a partner on the IGAD BMP Project, together with the Cousteau Society to a) lead biodiversity assessments for an improved understanding of biodiversity and ecosystem services in selected land and seascapes and, b) oversee the development of holistic and integrated transboundary landscape and seascape management plans. 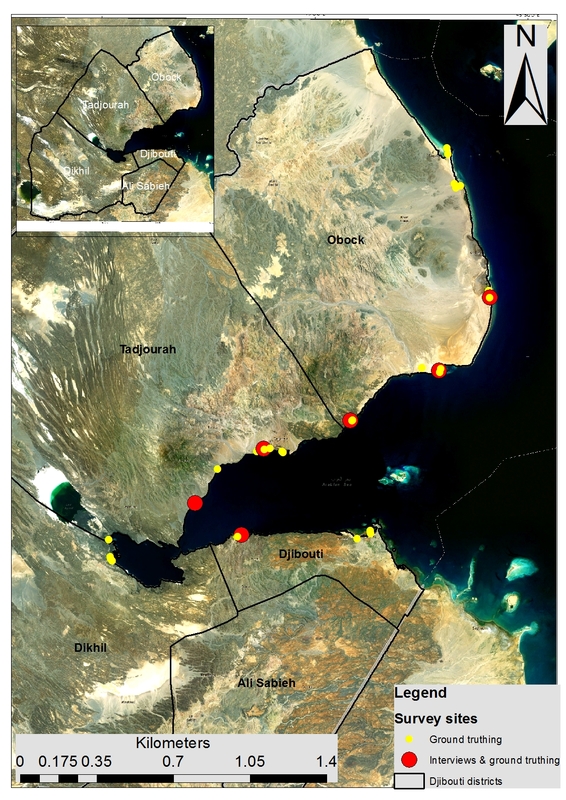 A primary focus of CORDIO’s work in 2016 was to further integrate data on the biodiversity and condition of coral reefs and other shallow inshore marine habitats in the Seascape Management Plan for the Gulf of Tadjoura and Ghoubet-el-Kharab. 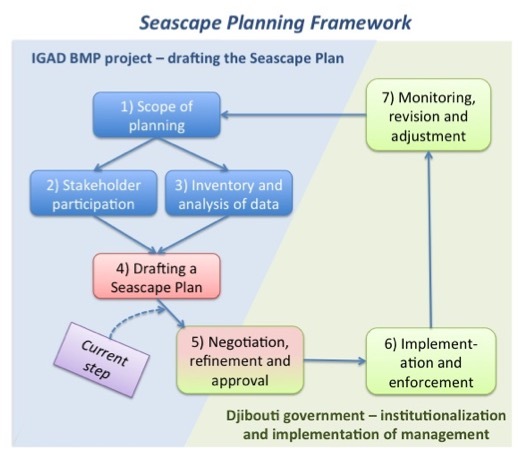 The revised seascape plan was improved further through discussions at a stakeholder workshop in October 2016 and the final product was the first seascape management plan developed for the Government of Djibouti. In 2017, the Djibouti Seascape plan will be formalised and submitted by IUCN and IGAD to the Government of Djibouti for final negotiations and the development of a roadmap for its implementation, monitoring and future revision. 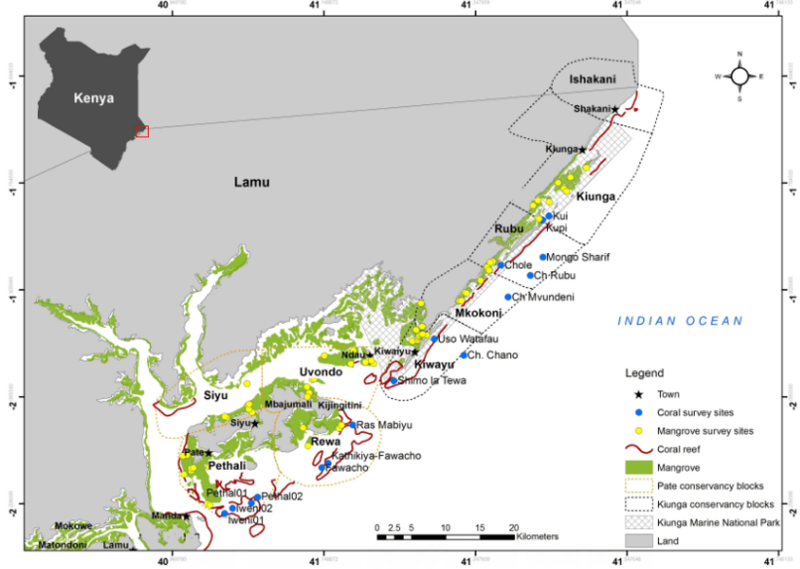 CORDIO conducted an assessment of the biodiversity of near-shore and pelagic marine habitats around the Lamu-Kiunga seascape in Northern Kenya as part of an International Centre for Research in Agroforestry (ICRAF)-led project funded by the Inter-Governmental Authority on Development (IGAD). The project aimed to link the use and benefit of these natural resources to the local people, as well as better understand the drivers and pressures of biodiversity loss to improve management measures. With additional funding from The Nature Conservancy (TNC), coral reefs and mangroves from Pate Island to Kiunga were surveyed because of the increased pressures on these resources due to increased human population. A working paper on the study was published in 2016. 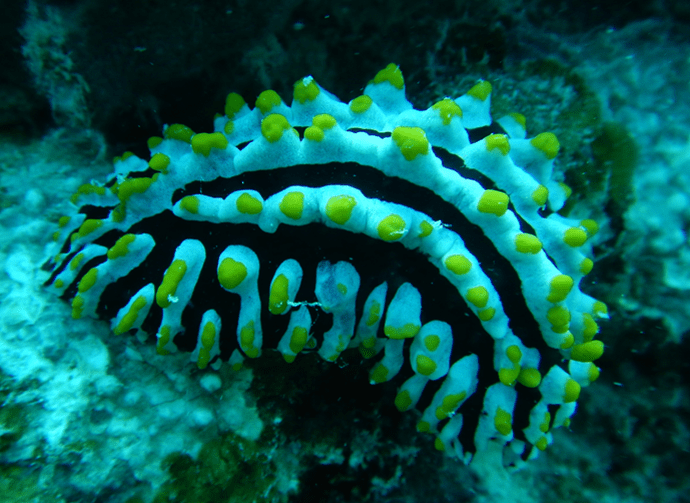 Globally rare coral species Siderastrea savignyana, Horastrea indica and Caulastrea connata and the endemic angelfish Apolemichthys xanthotis as well as six shark and nine ray species, dugongs, turtles, whales and dolphins were recorded to occur in the seascape. 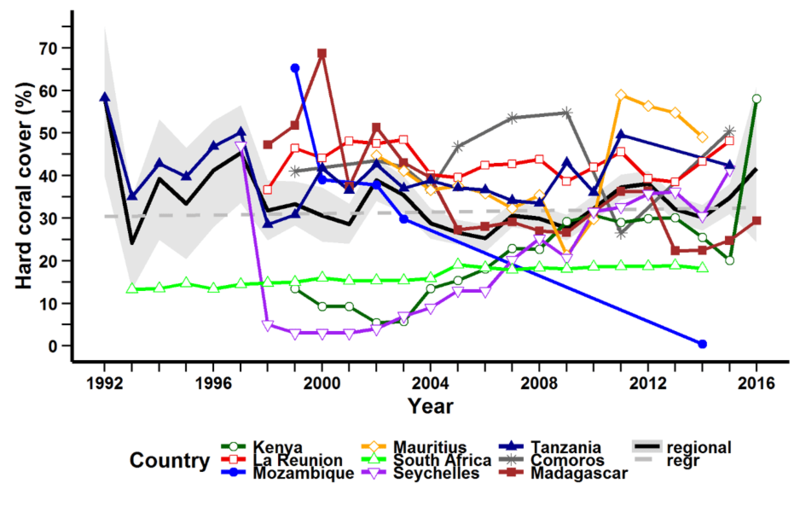 Mangrove cover and quality is good but has declined by up to 22% over the last two decades. The main threats to marine biodiversity include increase in human population, high poverty levels, deforestation of mangroves, clay mining for pottery and land tenure. In response to some of these threats, public and civil institutions have engaged in providing solutions including enactment of legislations and adoption of locally managed marine areas (LMMAs) also termed as community conservancies. 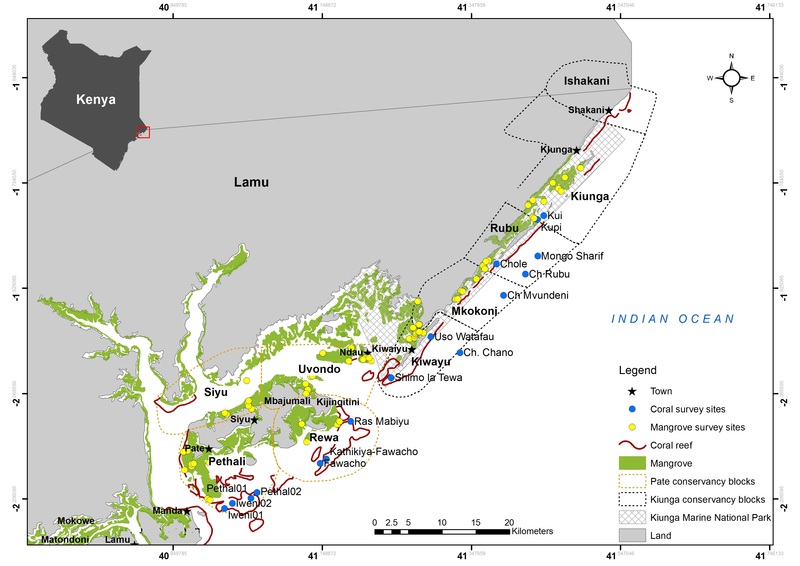 Integrating local knowledge, government regulations and science through a marine spatial planning approach has the potential to benefit ecosystems and communities living around this unique part of Kenya’s coast. The project report is envisioned to not only act as a conduit in the integration of science and local governance but also provide information needed to feed positively to the Biodiversity Management Programme (BMP) on fostering poverty alleviation through better environmental integration. 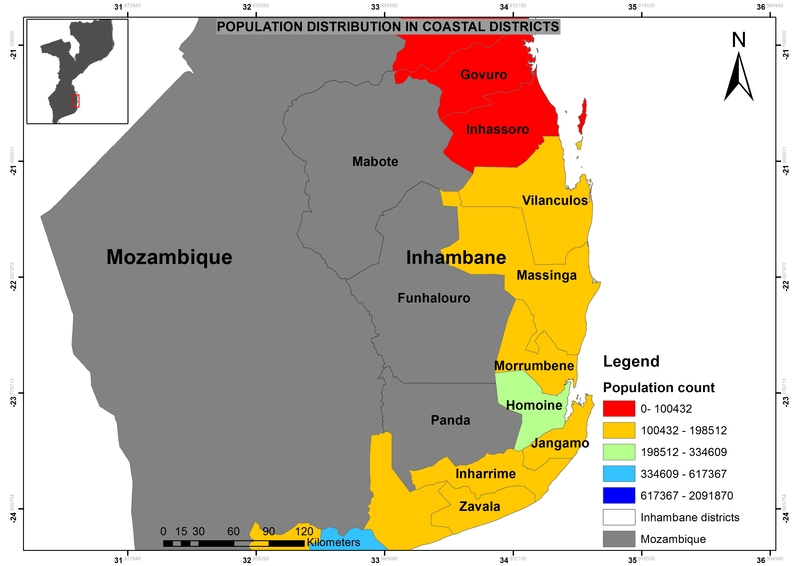 In 2016, CORDIO was part of a consortium led by IUCN-ESARO under the Resilient Coasts Programme designed to contribute to the project “Coastal Cities as Sustainable Economic Hubs.” The project aimed at promoting sustainable development in the coastal and marine area of the Province of Inhambane in Mozambique. CORDIO was charged with stocktaking of the ongoing sustainable development initiatives and projects and highlight any specific areas of high biodiversity value through a desktop review, geo-spatial analysis and site visit to Inhambane Province. 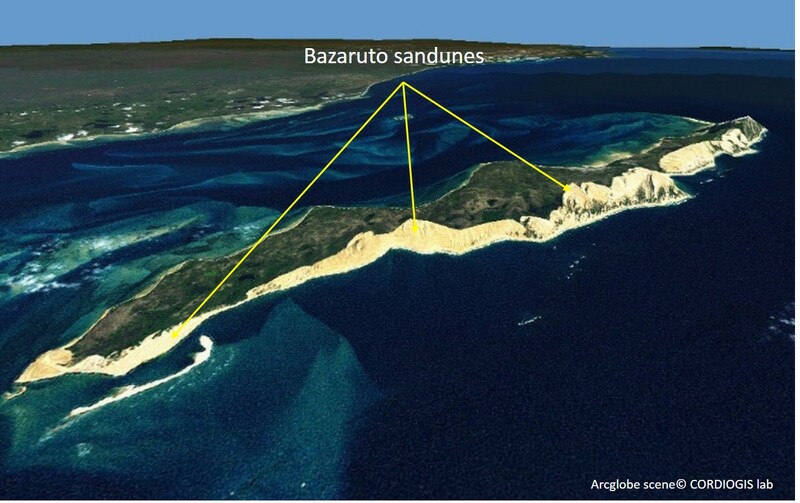 The geo-spatial data gathered in the form of maps and other tools, were used by partners to develop recommendations for a common vision for sustainable growth of Inhambane’s coastal municipalities such that the development would have minimal impact on the surrounding natural environment whilst being feasible and logistically plausible within the existing infrastructural framework. We also sought to analyse the suitability of potential solutions to the current and prospective threats affecting the sustainable management of the marine and coastal environment of the area. These solutions included natural marine resilience against natural hazards, coastal community approaches such as Locally Managed Marine Areas (LMMAs) and other community based marine environmental protection solutions including those that address overfishing. 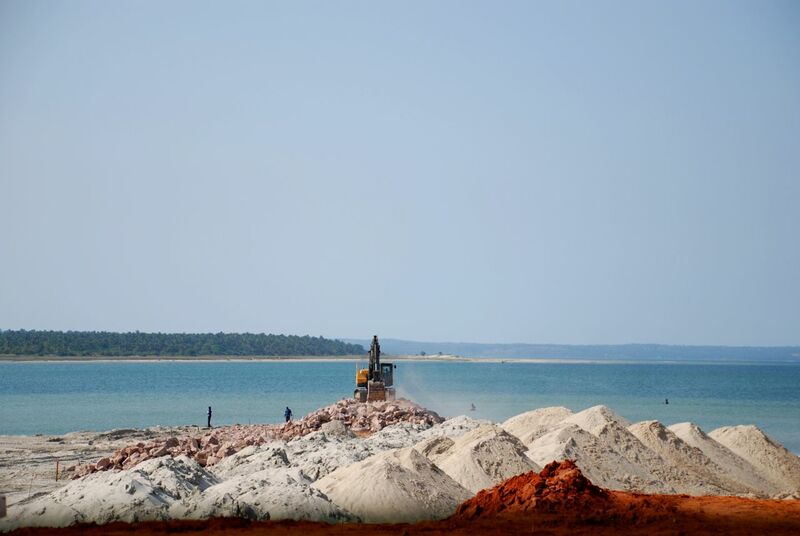 Environmental degradation of ecosystems, weak waste management and deficient planning is a common concern in the four municipalities of Inhambane Province. With increasing urban growth in the cities and increased climatic risks, environmental protection measures and climate resilience are becoming important issues that need to be taken into account. 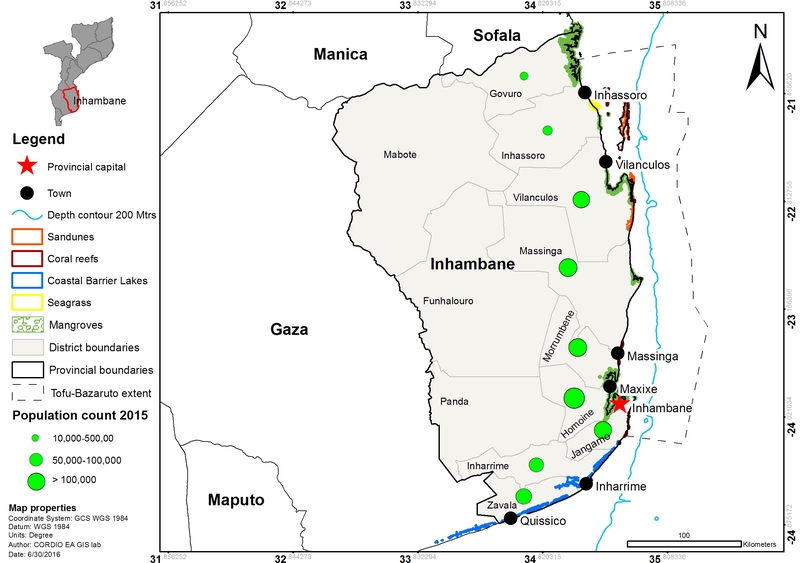 In 2017, the two reports produced will provide critical information on marine and coastal biodiversity and ecosystems useful in planning and identification of strategic investment options for enhancing the climate resilience and sustainability of the Province of Inhambane, with a focus on the four municipalities.